You couldn't have asked for a better weekend for foraging. Yesterday was our Foraging wild plants: collecting to cooking class with Christopher Robbins. We had a terrific day out gathering all manners of spring herbs. People seemed most interested in nettles. They loved the soup we made, marvelling at how generous you have to be with the amount of nettles in the soup. But the real surprise were these nettle fritters, the surprise being that the the nettles don't sting at all when cooked! You can pick fresh nettle tips, dunk them straight into tempura batter and deep fry. No sting, and they are deliciously crisp! If you're keen to come foraging with us, then keep an eye on our calendar for upcoming foraging dates. To make the batter Pour the ice cold water into a mixing bowl, mix in the beaten egg, add the flour and roughly fold in with a fork, do not beat, the batter should be lumpy! Add the ice cubes. Heat the sunflower oil in a wok or deep fryer. With the nettles choose succulent tips and leave enough stalk to hold on to. 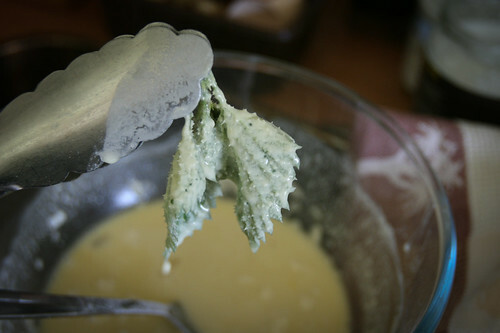 Dip the nettle tips into the batter a few at a time, allowing any excess batter to drain back into the bowl, the nettles should be only thinly coated and fry until golden, then drain on kitchen paper. Serve hot with a pinch of salt, a wedge of lemon and salsa verde. I made these yesterday, replacing the flour with cornflour for a gluten-free version. They were lovely and crispy. It was quite fun for children to dare each other to eat stinging nettles.